Marta Martínez Seymour is the director and one of the teachers at The Spanish Class Café TM. She came from Costa Rica to Seattle in 1984. She earned a Bachelor of Science degree in Business Administration from Central Washington University and has more than 20 years experience teaching the Spanish language. 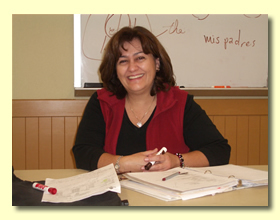 She taught Spanish for North Seattle Community College in the Continuing Education Program for more than 11 years. She wrote her own textbooks for her classes, which students have been using for many years. Her books have had a tremendous success and impact on the learning process of the students. Frequent complements have been made about the textbooks since she started using them for her classes. The books match the concise and direct method of Marta's teaching style. Teaching is obviously her passion, judging by the level of student 's satisfaction as well as how much and how fast the students learn. She has developed her own teaching technique based on many years of experience in teaching Spanish in the classroom, tutoring sessions, and private lessons to adults and young people. She has also taught children of different ages in the after school Spanish program and school camps with a curriculum created by her. The Spanish Class System TM, which Marta created, gives students the tools to be in control. After just a few classes students will have the capability to build their own sentences, and to have a basic conversation. This has been the result for hundreds of students and it can be for you, too. The Spanish Class System TM does not limit you to prefabricated sentences. You will learn how to speak Spanish and how to create your own sentences starting from your very first class. One of Marta's hobies is photography. She was an award winner in the 2008 Edmonds Photo Marathon. Learn more about the classes or go to the main page. Our classes are small and spaces are limited.